NEW YORK (WABC) -- The MTA has released details of its Fourth of July holiday weekend service, with extra trains being added Friday, July 1, to allow customers to get a head start on the festivities. Subways, buses and Metro-North will operate on a Saturday schedule on Monday, July 4, while the Long Island Rail Road and the Staten Island Railway will operate on a Sunday schedule. The LIRR and Metro-North will provide additional early-afternoon service from Manhattan on Friday, July 1, for customers planning an early getaway for the start of the Independence Day holiday. Between noon and 4 p.m., 17 extra trains will depart Grand Central Terminal and 10 extra trains will depart from Penn Station. And the LIRR is offering plenty of extra train service to the East End over the extended Independence Day Weekend, including new Fire Island Ferry connections on top of the railroad's already enhanced summer Montauk Branch schedule. On Monday, July 4, subways will operate on a Saturday schedule. There will be no 5 train service in Brooklyn, and no 6 or 7 express service. B trains will not run, customers are encouraged to use the A, C and D lines and/or Q instead. M trains will not run between Delancey-Essex Sts and 71 Ave; Q service is suspended between 57 St-7Av and Ditmars Blvd; and Z service is suspended, take the J instead. There will be increased subway service on the 4, 7, A, C, F and S 42nd Street Shuttle prior to and following the Macy's fireworks celebration, which will originate from five barges on the East River: four between 23rd and 37th Streets, and one south of the Brooklyn Bridge Park from 9:20 p.m. to 9:45 p.m. 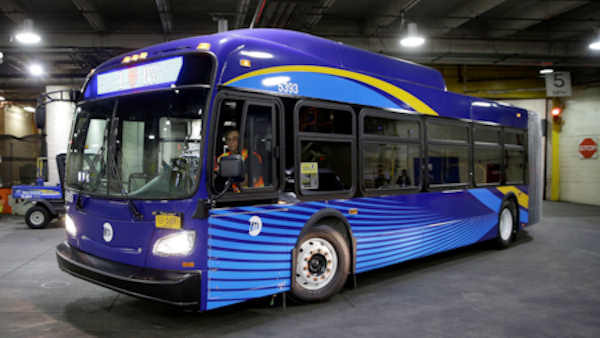 Buses operated by MTA New York City Transit and the MTA Bus Company will operate on a Saturday schedule on Monday, July 4. There are many routes that either do not operate on Saturdays or do not run on part of the route at certain hours. Customers traveling on the Fourth of July should check Saturday schedules, lines and routes. The following bus routes may be affected by delays and detours: M5; M8; M9; M14 A/D; M15 SBS; M20; M21; M22; M 23; M31; M34 SBS; M42; M50; M57; M103; B6; B24; B25; B32; B38; B41; B52; B61; B62; B63; B67; B69; B103; Q32; Q59; Q60; Q101; Q103. Staten Island Railway customers looking to get a head start on the Fourth of July holiday will be able to catch earlier afternoon express train service on Friday, July 1 with MTA Staten Island Railway's Early Departure Getaway schedule. Extra SIR trains will be added earlier in the afternoon beginning at 2:30 p.m. from the St. George Ferry Terminal. There will be one express train and one local train awaiting every boat until 7:50 p.m. On the Fourth of July, SIR will operate on a Sunday schedule. Staten Island Railway is prepared to add additional service prior to and after the fireworks, as needed. MTA Bridges and Tunnels will suspend all lane closures related to routine maintenance and temporary construction work beginning 6 a.m. on Friday, July 1, through the end of the morning rush on Tuesday, July 5, to accommodate motorists traveling throughout the busy travel weekend. Any extraordinary weather-critical work that must be accomplished over the holiday weekend would occur only during overnight hours when traffic is at its lightest. Motorists can ease their trip by using EZPass.